It’s been quite some time but I haven’t forgotten it and I’m very thankful for kimchisama for tagging me. I think various tags and awards are not only fun but also very healthy, as at least for me it provokes to get out of the comfort zone and think and write about things that I would probably never write about otherwise. Of course, a few lines of different content isn’t much but it’s better than always writing the same thing over and over again. So let’s get started. As far I understand, this tag came from the book-lover community and got a bit transformed along the way. Let’s say that the rules are to take each letter of your name and to choose a subject whose name begins with that letter. The subject must be one that you plan to experience not too long after. Speaking about the subject, I think it would be more appropriate for it to be a manga but since someone (including myself) may be more of an anime person, anime are also liable. The perfect way would be to do two lists – one for anime and one for manga but I’ll take an easier solution and go with anime only. Especially since my anime knowledge still proved to be barely sufficient to fit every letter so it would be an impossible challenge using only manga titles. So yeah, my anime To be Watched List based on my name. A – Akira, arguably one of the most prolific films during the 80s. Going off on a tangent, do you still remember Shoujo Shuumatsu Ryokou? I hope that yes, because then you should remember its ED and might know that it was key animated by the original creator of the manga tsukumizu. It was celebrated as an achievement, but listen to this now – the famed Katsuhiro Otomo both created the Akira manga (apparently also worth checking out) and directed the film, so how accomplished a creator should be to manage to succeed in both mediums? So yeah, I’m saving this one as some special treat on a rainy day. L – Log Horizon. Being advertised as “SAO, but good” sounds interesting enough. The goals of the characters may be not as clear and definite as escaping the game but deeper stuff like interactions with the NPCs and taking advantage of the game mechanics more complicated than simply fighting is what I heard makes the show compelling. Can’t argue with that unless I try. D – Doukyuusei. It’s not that I’m into shounen ai, b-baka! 2016 was a great year for movie goers but this film was almost completely overshadowed by Kizumonogatari trilogy, Kimi no Na wa, Koe no Katachi and my favorite Kono Sekai no Katasumi ni. Seemingly it deserves far more prominence as I’ve yet to hear anything ground-brakingly bad about this one. The director Shouko Nakamura has animated some Mushishi as well as worked under Sayo Yamamoto, Hiroyuki Imaishi and Kunihiko Ihuhara, so that’s a very impressive resume. A – AnoHana. Just for the sake of having seen it. 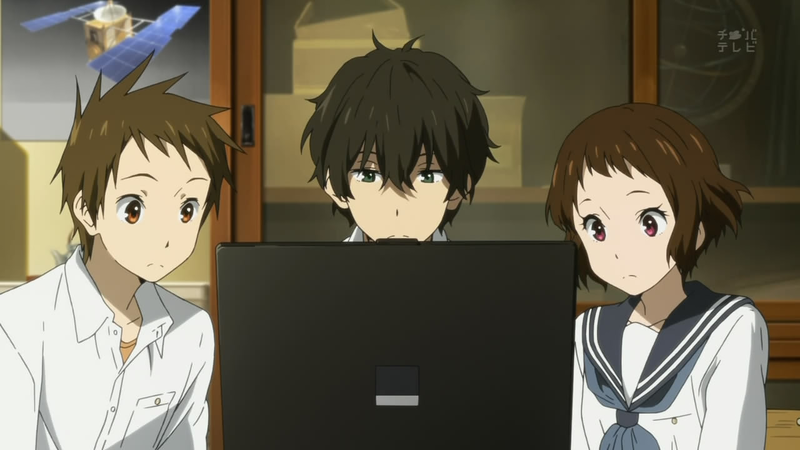 The staff of AnoHana later on reunited and worked on Kokoro ga Sakebitagatterunda which didn’t impress me that much. Everything’s fine, there’re some very nice moments but I guess everything’s just not my cup of tea. The director Tatsuyuki Nagai as well as the famed Mari Okada also worked on Toradora, and to be frank it might be my most controversial opinion about any anime but that show was stale as 2-year old loaf of bread. Teens crying over everything and refusing to think is actually a thing but such extent of exaggeration didn’t sit well with me at all. I expect something similar of AnoHana, but still (probably vainly) hope that I may find something to like about it. E – EVA reboot films. There aren’t many anime whose names begi with E, are there? Well, calling it EVA might be a little cheating but oh well, I read Elfen Lied and Eureka 7 might be too long to tackle it right now. It’s not that I’m likely to watch the reboot films any time soon since after watching the original I decided to wait for the last film to be made and then marathon everything. If that last film ever comes out that is. Man, it seems like Miura is more likely to end Berserk than Anno will finish his project. Redline was being produced for 7 years and it’s now 6 years since 3.0 came out. Anno may have come to a conclusion that he and a Gainax ending are inseparable but let’s have some faith. L – Legend of the Galactic Heroes. It’s hard to come up with anime that begins with L. Especially 2 times. I’m well aware about the currently airing remake but as it doesn’t seem to be that much better or worse than the original (well, that’s taking into account only the first episode of this new show), I think I’ll play it safe and start with the original. I wonder if it’s as good as almost everyone makes it to be. Everyone seems to know about it but how many have completed it? Feel free to use the tag in any way you wish – manga list, anime list, combined list – as long as it’s fun. Not bad at all — those titles that make up your name. Finally, my time has come. Thanks for the tag yo! Log Horizon does sound interesting with a fun tag too haha! You have a nice list! May take a few days, but this could be fun! It was for me. Looking forward to your list! The first time I got this tag. Thank you so much, I am excited to use this fun tag.